Sonya graduated from Williams College where she focused on Film and Media Studies and English. Throughout college, Sonya developed a greater interest in creative writing, history and politics. 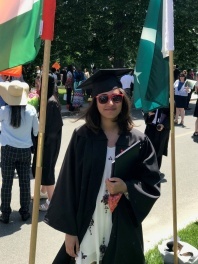 She participated in Williams’ Asian American Students in Action group, The South Asian Students Association and was also co-chair of the Film Club where she worked on short films and organized screenings on campus. She also worked as a Media Studio Technician, assisting student bands with audio-mixing and recording. In her senior year, Sonya directed and shot a 20-minute documentary on familial musician pairs while interviewing local artists in Western Massachusetts. In her free time, Sonya enjoys watching movies and reading science fiction and fantasy novels. She hopes to one day become a writer or filmmaker. Sonya is excited to be in Hong Kong and eager to try more local cuisines. She also hopes to travel around Asia and learn more about HK-China political relations.